Moving into a new neighborhood is always interesting. It’s especially interesting in a city that has recently slipped beneath the waves. There’s good news and bad news about life in Brickell. The good news is that there’s almost no street crime in this neighborhood. Since the police are overwhelmed and the National Guard isn’t doing law enforcement, crime has increased dramatically in some areas. Robbery, extortion, gang warfare, drug trafficking, maybe even human trafficking. There are places where even the police won’t go at night. They won’t admit it, of course, but make a call from that area and they won’t come. The bad news is that Bastion has a heavy presence here. The security forces downtown are a mix of National Guard and Bastion. But here in the financial district, it’s all Bastion. For the moment, all the banks and financial offices in Brickell have chosen to stay in the city. So there are still thousands of people doing billions of dollars worth of business in Brickell. They have enough money to hire Bastion for their highest level of protection, which basically means buying your own small army and intelligence service. Honestly, they’re probably safer now than they were before Miami fell to Florence. We had a tense encounter with them on our first day in the city. A large black speedboat carrying half a dozen men in black body armor stopped us on the way into Brickell. We must have looked like squatters to them because they took one look at us and sprang into action. Their boat turned sideways to block our passage and four of them held their assault rifles at low ready, watching us for any signs of aggression. One of them spoke to us on a bullhorn, telling us that this was a restricted area and we had to leave. Jess was really eager to give him an earful, but we had agreed that Harold and I would be the two main negotiators with any armed groups. Luckily, Harold had the foresight to bring a bullhorn too. He informed the Bastion captain that we had been sent here by the owner of One Broadway. He also said that this is not a restricted area, and unless these men were duly deputized officers of the law, they had no business detaining people on a public street. The Bastion captain looked very annoyed. He said that he was deputized and that he didn’t like Harold’s tone. Harold is a perfect gentleman, though, so his tone was very reasonable. The captain just wasn’t used to anyone talking back to him. Harold asked who had deputized him and the captain said that it was the Miami Chief of Police. Then the captain asked why he should believe us that we had been sent here by a building owner. Harold replied by asking why we should believe the captain the he was deputized. Jess laughed out loud at that comment. I laughed a little too. It broke the tension. The captain just got really frustrated and told us he’d be keeping his eye on us. Then he motioned for his men to stand down and the boat started speeding away. He has definitely been a man of his word. When we’re out running errands, we often see him and his men giving us the stink eye. They even cruise by sometimes at night, shining their bright lights into our lower floors to see what we’ve been up to. The focus of our first week was renovations. The ground floor of One Broadway was still visibly damaged by the storm and the saltwater. Our first order of business was to remove anything that was clearly broken or too waterlogged to keep. Jess, Ermete, Harold, Murray, Jalen, and I spent a few hours on that first day knee-deep in the water, pulling out ruined furniture, boarding up broken windows, and so on. Shortly after we arrived, we unloaded our first batch of supplies and put them in what would quickly become our main office on the second floor. Then we started loading trash into the boat and made a few trips to a nearby parking lot that was being used as a dump site for nonhazardous waste. Eventually, we picked up Ten and the others and brought them to our new home. The first night there was fun but a little scary at the end. The building was mostly empty, so we had our choice from any number of high-end, fully-furnished apartments. We could have each had a floor to ourselves, but instead we decided to stick to one floor for security reasons. Jess, Ermete, and I decided to bunk together. Tenalach and Harold shared the apartment next door. The rest split into two or three small groups. After setting up our sleeping quarters for the night, Harold and I decided to go door to door and visit all of the residents left in the building. That was an interesting experience. There were only twenty-two residents left in the building, scattered across fourteen different floors. They were all what I would call wealthy — not billionaires, of course, but wealthy enough to consider the high rent here a minor detail. These were people who stayed in the city after Florence because they had some important job in finance, insurance, or real estate. They were polite, well-dressed even at home, young to middle-aged, mostly Latino, and glad to hear that the owner had sent someone to look over the building. Of course, we didn’t go into details about our full plans for the building. Keeping it short and simple may have helped with the warm reception. One step at a time. After going door to door with Harold talking to residents, I caught up with Jess and Ermete out on the outdoor tennis court on a balcony a few stories up. It turns out that the little pizza place on the ground floor had somehow managed to reopen a few weeks after Florence hit, so they had gone downstairs and gotten a couple of pizzas. The three of us sat around for a long time eating pizza and talking philosophy and looking up at the stars. It was a good way to relax at the end of the day, and we’ve done it several times since. The scary part came in the middle of the night when we all heard gunfire. Unfortunately, it’s not that uncommon to hear automatic weapons fire in the distance at night. It’s still not safe out there at night. But the gunfire isn’t really noticeable in our building. So when we heard that loud, distinctive, repetitive popping, we knew it was trouble, and we knew it was close. Ermete grabbed a walkie-talkie while Jess and I looked out the window. As planned, we left this lights off so as not to attract attention. I felt vulnerable and a bit silly crouching by the window in my underwear in my dark, peeking outside to see what was happening. I couldn’t see much from my angle, but it turns out that Bastion was having a gun battle with a handful of criminals who picked the wrong neighborhood to rob. The gunfire stopped after a few minutes. Harold told us over the walkie-talkie that two criminals had been killed, one Bastion had been wounded, and the rest of the criminals had fled for their lives. Luckily, neither side drew us into the conflict. Still, though, the violence is disturbing. I’m not used to violence, not yet anyway. Ermete went back to sleep pretty easily, maybe because he has traveled to dangerous places before and is used to the danger. But Jess and I stayed up for a long time in the dark, talking in hushed tones about what had happened and how we felt about it. I actually don’t remember falling asleep, which is rare for me. We just talked a long time until eventually we drifted off to sleep together on the couch. That’s probably the most violence we’ve had around here so far. Like I said, there’s a good side to having so many Bastion in the neighborhood. They hassle us sometimes, which I’ll talk about in more detail next time. But they also keep out other criminals. We hear commotion outside sometimes, but most criminals don’t even try anything here because they know Brickell is off limits. Even the drug cartels don’t want to push Bastion too hard out of fear of retaliation on their home turf overseas. If you think what Bastion does in the U.S. is bad, you should hear about what they do in other countries. I didn’t even know it all until Jess started showing me the stories. I hope and pray that they don’t ever start using those tactics here. Not much else changed during our first week. We got everyone on the team moved into One Broadway, talked to the residents, did some basic cleanup and renovation, installed some rooftop solar using the solar modules we brought with us, and started meeting up with a few other people with similar interests. 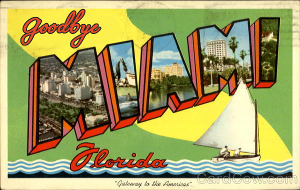 There were some struggles along the away, but given the fact that Miami is literally a disaster area, I feel like it went well.